You are probably wondering what the title of this blog has to do with leadership. It comes from a speech by author Neil Gaiman, and borrowed for a very engaging video I watched last week. If you follow the link you’ll see that the student, Sarah Almeda uses motion graphics, in this case doodles, to represent her ideas: Let’s Make Some Good Art. She explains as she is drawing that thought is her creative medium, and that she is inspired when she can collaborate and brainstorm with others to create new ideas, representing them through drawing and design. She is particularly inspired by Neil Gaiman and his advice that if you are pursuing a career in the arts, it is better not to know the rules, not to know what is possible or impossible so that you can stretch those boundaries (Neil Gaiman 2012 Commencement Speech “Make Good Art”) . 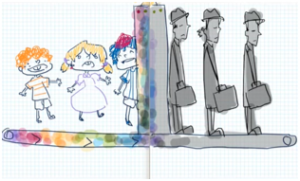 As I watched her doodles fill the screen and listened to her explain her hopes for her education, including her quoting Sir Ken Robinson in saying that schools were like factories that stifle creativity, I wondered how we as educational leaders could do a better job of nurturing students’ individuality, talents and interests. Sarah talks about the importance of rejecting the one right answer for making glorious and amazing mistakes, on the way to creating something unique and worth having. So in some ways, Sarah’s six-minute video is a mini-lesson on innovation. She provides cues to teachers and administrators on how to make the learning process more meaningful and engaging, and also more about learning. This reminded me of a paradox in our society: while one of our founding principles as a nation is the importance of individuality, we somehow created a school system that instead values standardization. I think we all understand how this happened, but what is harder to explain is why it is still happening. Given all we know about how students and adults learn and invent, with lessons from research and from design thinking, why haven’t we made significant changes in the way our schools are organized or in the patterns of classroom instruction? To me, this is the leadership challenge of our era. With all the tools we have before us, and with the voices of students like Sarah Almeda in our head, we must create a different kind of schooling that inspires our students to find joy in learning and also to excel. This entry was posted in Blog and tagged art, creativity, leadership, learning, research, teaching. Bookmark the permalink.